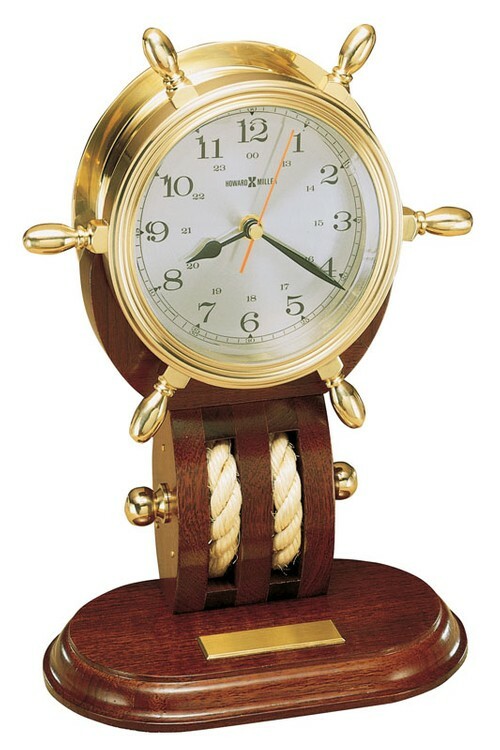 Polished and lacquered solid brass Howard Miller ship's wheel clock rests on a mahogany base which features nautical rope and brass knob detailing. Spun silver tone Arabic numeral dial and 24-hour time track. Beveled glass crystal. Includes a brass self-adhesive, engraveable plate with polished beveled edges. Customization charges additional. Quartz, battery operated movement. Requires 1 AA battery, not included. 12 1/2" x 8 1/2" x 5"